Actress and comedian Caroline Quentin was born in Reigate, Surrey, in July 1960 and was educated at the independent Arts Educational School, in Tring, Hertfordshire. Her early stage work included a stint in the chorus of the original English production of the musical Les Misérables in 1985. Before then, in May 1984, she had appeared at the Palace theatre in Edward Bond’s Saved, where the cast also included future stars Gary Oldman and Kathy Burke. Moving away from theatre, Caroline became known for her television appearances: in particular portraying Dorothy in Men Behaving Badly (1992–1998), Maddie Magellan in Jonathan Creek (1997–2000), and DCI Janine Lewis in Blue Murder (2003-2009). 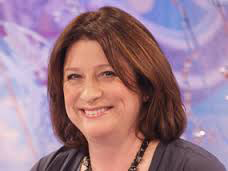 In March 2011, the documentary Caroline Quentin: A Passage Through India aired on ITV. Caroline had harboured a desire to visit India since she completed a school project about the country as a child. The documentary followed her as she travelled from the North to the South. This career change led to further documentary work, presenting Restoration Home on BBC2 and hosting Cornwall with Caroline Quentin and Caroline Quentin’s National Parks. In her personal life she was well-known as the wife of comedian Paul Merton. Their marriage lasted from 1990 to 1998. 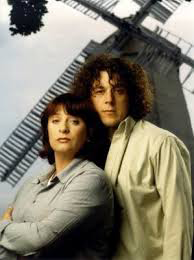 She subsequently met Sam Farmer on the set of Jonathan Creek, and they were married in 2006.